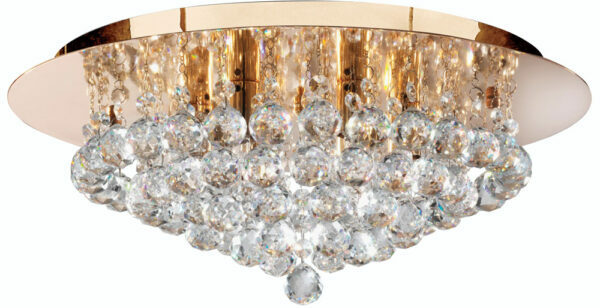 This Hanna polished gold finish 6 light flush crystal ceiling light is stunning and features a circular mount and mirrored gold face plate, with masses of cascading drops and faceted crystal balls that form a peak in the centre. The six lamps sit within the crystals to create a sparkling effect and the low height makes it ideal lighting for rooms with a low ceiling. This crystal light looks magnificent in any bedroom, living room, dining room or kitchen. A luxurious light that fits flush to the ceiling, with six central lamps surrounded by decadent crystal trimmings and balls. The elegant mirrored gold fascia reflects the light beautifully and completes the look of this contemporary chandelier. There are matching fittings in the polished gold Hanna lighting range that includes a very large eight light, four and eight-light flush mounts and two-light wall fitting; please see below. 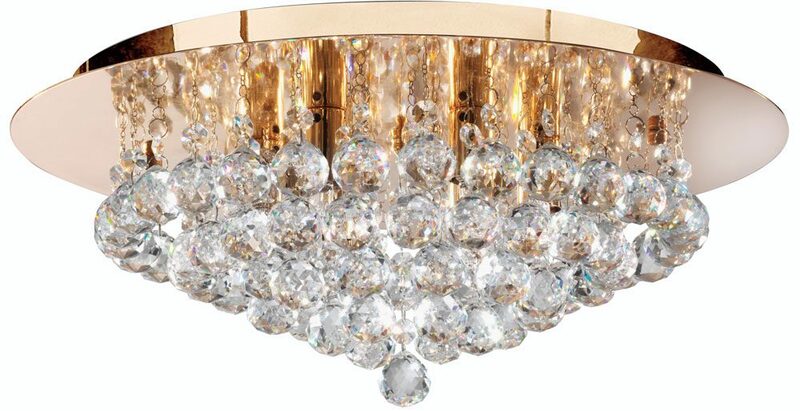 This crystal light is supplied by Searchlight who manufacture some of the best traditional and modern classic designs such as the Hanna polished gold 6 light flush crystal ceiling light you see here.